Signed and shared, thank you Cal. Signed and noted! Thanks Roberto and Cal! noted, signed & shared (FB) - thanks so much Cal! Thanks Cal. Noted & signed. We've got 472 signatures, help us get to 1,000 !!!!!!!!!!!!!!!!!!!!!!!!!!!!!! Gladly signed. These native species of Indonesia are only found there. Please help encourage the government to stop deforestation. Thanks. Noted. Thanks Cal, already signed. Noted and signed.A very beautiful bird it would be sad if it was allowed to become extinct. Signed & Noted. Thank you Cal. noted, signed, shared on fb, twitter, g+, thx. I was shocked when I read a report yesterday, that in the past 40 years 2/3 of the world's forests have been cut down. Although it said that the rate at which the forests are being clear-cut has slowed, it seems to me that the continuation of this action spells DOOM for our planet. I mean, How F***ing stupid are we? 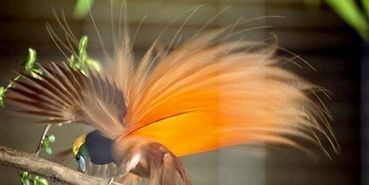 Every day more and more incredible creatures on the planet like this amazing bird of paradise are becoming rare..! Stop the mass deforestation! think of the future of the earth and its inhabitants. Signed and noted. Thank you, Cal. Signed #636. Noted. Thanks, Cal.